It’s Day 11 and I have a review of a children’s sleeping bag I got from CSN Stores (now Wayfair) today. Most of the blogosphere must have heard of CSN Stores by now as there are reviews and giveaways all over the place. If by chance you are out of the loop, CSN Stores is a group of over 200 stores that sell just about everything from housewares to baby and kids to furniture. Since this is a camping event, I decided to get a sleeping bag for one of my daughters. Unfortunately, it didn’t come in time to try it out at camp but my eldest daughter tried it out a few nights in a row when we came home. It’s very warm and soft and comes with a little matching pillow. The zipper is pretty easy to open and close and my daughter LOVES it. The one she picked out has fairies on it but there are other themes too. 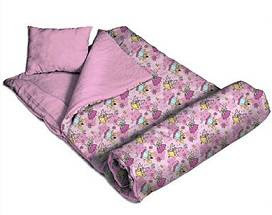 Specifically we chose the Wildkin Fairies Sleeping Bag but Wildkin also has ballerinas and butterflies plus there are other brands with ponies and princesses and other themes. It’s technically a slumber bag which means it’s more for indoor use and not really for camping but would still work for summer camp or spring and fall with an extra blanket. When my daughter is ready for sleeping over a friend’s house, she’ll be all set.